Losse dominates the Vézère valley. Enclosed in a fortified medieval site, “le grand logis renaissance” offers a sumptuous decor with authentic furnishing. Walking in the green chambers bedrooms of the garden and in the park complete the visit. Audiovisual presentations. Shop. Castle and gardens are opened everyday from 1st May to 30th September, from 12pm to 6pm. Closed on Saturdays except on bank-holidays weekends. 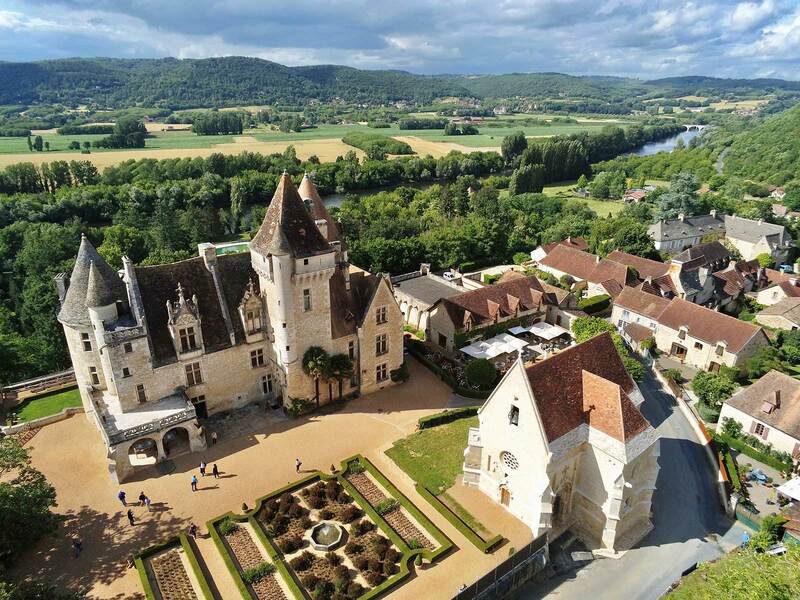 Auriane’s tip: For a photo of the castle from the Vézère River, take on the left while exiting the castle, at the roundabout, take left again and then follow the road in the Montignac direction. You will be able to take a photo of the terraces as well as the cascades of roses and boxwoods. Read Auriane’s article. Founded in the 12th century, Castelnaud castle, which once belonged to the English, oversees the Dordogne Valley. 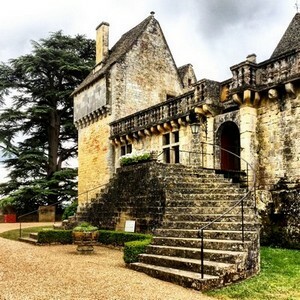 Abandonned during the French Revolution, listed “Monument Historique” (French National Heritage) since 1966, Castelnaud castle offers a beautiful panorama on Beynac, Marqueyssac and la Roque Gageac. Open to the public since 1985, this fortified castle is fully dedicated the art of the war during the Middle Age. Come and discover its large weapons and armours collection, its furniture, its war machines recreated life-size. To complete the models exhbited, audiovisuals will allow a better understanding of the different types of attacks and defences of a medieval castle. 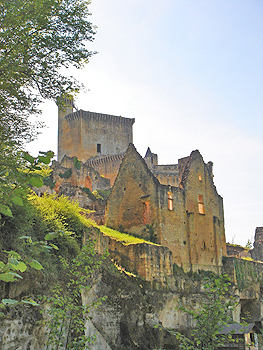 Castelnaud Castle belongs the Rossillon family, the castle benefited of three important refurbishing campaigns. Today, the site welcomes more than 220,000 vistors by year, including 20,000 scholars. February, March and October to 11th November: 10am to 6pm – April, May, June and September: 10am to 7pm. Open visit duration: between 1h and 1h30. Library, Middle Age shop open all year round, tavern in season. Commarque is situated close to a water spring, which attracted men since the prehistoric time. Its first legendary seigneur is Bovon, who fought the Sarrasins during the Charlemagne period. During the 12th century, when Garin and then Radulphe de Commarque were father abbots of Sarlat, some noble family built towers in Commarque. The fortified village was born with its troglodyte houses and its church. Two towers survived: The Commarque tower and the Beynac tower, masters of the seigneury from the 13th to the 18th centuries. Around 1380, Pons de Beynac enlarged the donjon and the castle. During the One Hundred Years War, Commarque is taken by treason by the English. A walk in the valley offers extraordinary views of the Commarque huge archeological site and on Castle de Laussel, which faces it. The site visit ends by climbing the vertiginous Pons de Beynac donjon and with a panorama of the entire preserved valley. 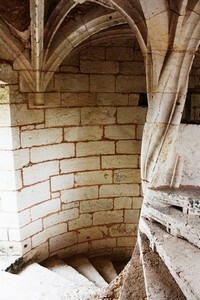 La visite du site se termine par l’ascension du donjon vertigineux de Pons de Beynac et sur un panorama de la vallée entièrement préservée. Open from 30th March to the end of the All Saints Day Holidays. 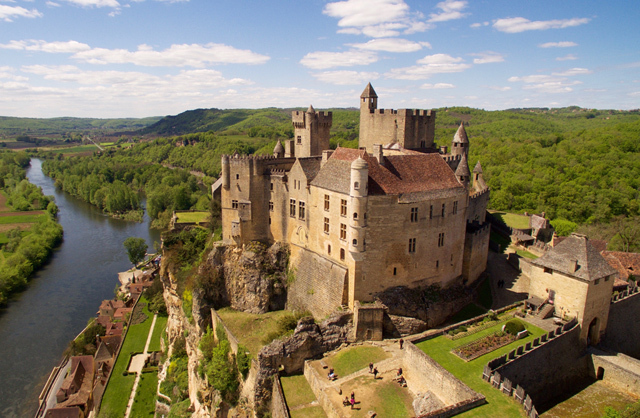 Beynac Castle dominates on a fabulous site, at the top of a rock, facing the Dordogne Valley. 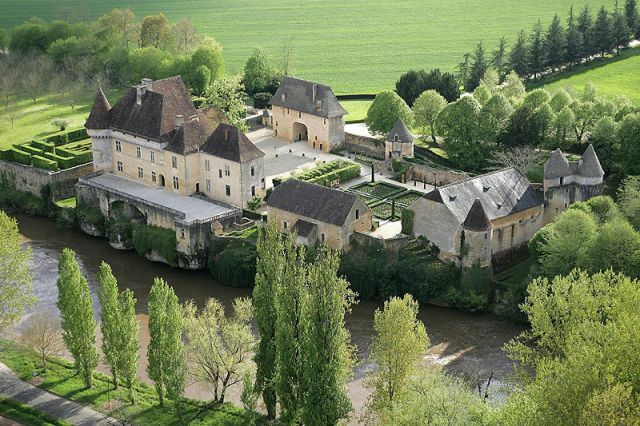 This feudal fortress is an old barony of the Périgord. From 10am to 6.30pm during the high season. From 10am to 6.00pm during the low season. Closed on 25/12 and on 01/01. One of Guide du Périgord’s favourite: It will amaze all public (big and small) during any seasons. Not-to-be-missed visit! Auriane’s tip: Choose guided visits instead of open visits, as there is no explanation boards insides. The guides will also bring a touch of humour making the visits very attractives. Read Auriane’s article. This castle, which kept its military character, has a triple ramparts with many protective towers. You can see a large panorama from the terrace access on which the castle is raised. APRIL - MAY - JUNE - SEPTEMBER: open from 10.30am to 12.30 and from 2.30 to 6pm. Closed on Tuesday morning and Saturday all day. JULY AND AUGUST: open from 10.30 to 18.30. OCTOBER: open from 2pm to 5pm. Closed on Saturday all day. 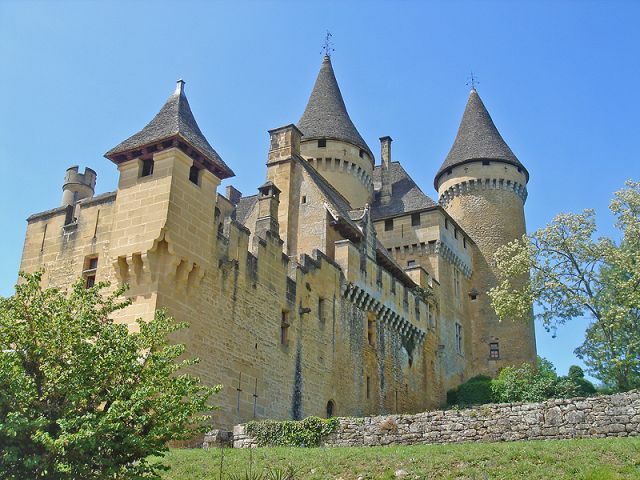 Situated on a steep hill at the heart of black Périgord, this castle built during the 15th and the 16th centuries with the Périgord yellow stones, is entirely covered by lauzes. 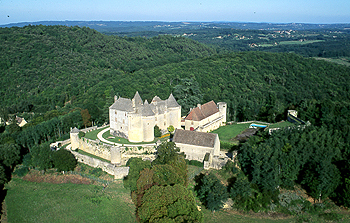 Château de Puymartin dominates the Beune Valley between Sarlat and Les Eyzies. From 1st to 15th July: from 10am to 12pm and from 2pm to 6.30pm. From 15th July to 25th August from 10am to 6.30pm without interruption. Auriane’s tip: During summer, night tours each Tuesday from 8.30pm. Discover the legend of the White Lady. Read Ariane’s article. Today, this site is revitalized thanks to the conservation work undertaken, the historical and archeological research and also thanks to a serie of concerts taking place during the summer. From 1st April to 31st May: 10am to 7pm. Closed in June. From 1st July to 30th September: 10am to 19h. Rest of the year, visit by prior booking only. Guided visit (1h30) only by prior booking. Auriane’s tip: The kid’s booklet game is ideal to discover the castle while having fun. Read Auriane’s article. Former residence and “nursery’ of Joséphine Baker. A pleasantly designed garden surrounds the castle: From the terrace, there is a view on the park. A helical staircase deserves each floor. This art that existed well before the Middle Age is now live in Château des Milandes. In the oldest tower of the castle, accessories of the falconryman and many documents reveal this ancestral practice. Meet these majestuous hunting birds of prey (living birds), roman: "Jacquou le Croquant". Open from 22/03 to 11/11. From 09.30am to 7.30pm in July and August. From 10am to 6.30pm in May, June and September. From 10am to 6.15pm in April and October. Closed on Saturday morning in April and October. Visit the park of Montfort Castle, and follow the history comments of the official guide. From 01/01 to 31/05 every day from 10am to 12.30pm and from 2pm to 6pm. From 01/06 to 31/08 every day without interruption from 09.30 to 6.30pm. From 01/09 to 10/11 every day from 10h00 to 12h30 and from 2pm to 6pm. Eyrignac Manor and gardens are situated 13 km North-East of Sarlat, on the historic road of the 1001 castles of Périgord. The manor was built in the 17th century by Antoine de Costes de la Calprénède, on the ruins of the precedent "Repaire Noble", burnt by the troups of Grand Condé. This property always belonged to the same family and therefore has remained in the same original state. The French style gardens were created during the 18th century by Louis-Antoine-Gabriel de Costes de la Calprénède. Restored to their original state by the present owner, Patrick Sermadiras de Pouzols de Lile, they are exceptional and are worth visiting. The gardens are opened all year round without exception. From 1st to 31st October: 10am to the beginning of the night. From1er November au 31 December: 10.30am to 12.30pm and from 2.30pm to the beginning of the night. Auriane’s tip: Playful and funny mysteries for the children. A surprise will wait all the budding Sherlock Holmes. Read Auriane’s article. One of the best success story of the French gardens history: 22 ha, 5km of alleys and 150,000 of hand trimmed boxedwood are the legacy of several generations of the same family. 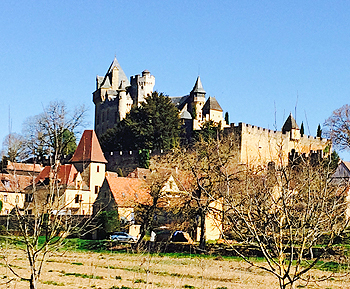 Installed in the castle since 1692; Julien de Cerval left his legacy to Marqueyssac. Julien de Cerval was very fond of the Italian culture and enhanced the picturesque beauty of the site by creating alleys at the bottom of the cliffs, panorama, meditation and poetry sites. The visit of the park is adapted to all ages. 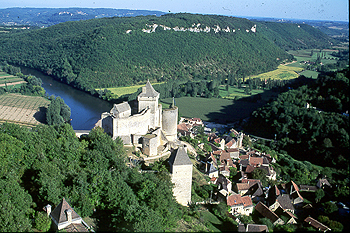 You will discover the nature and the Périgord sites, presented by the Castelnaud castle team. From 09am to 8pm in July and August. From 10am to 7pm in April, May, June, September; from 10am to 6pm in February, March and October to 11th November. From 2pm to 5pm from 12th November to end of January. Auriane’s tip: the garden is decorated with 2000 candles for fairy nights every Thursday evening during the summer Read Auriane’s article. The garden is an art: each garden is a painting, a universe, and we are the privileged visitors. The Cadiot Gardens in Carlux: it is the art of gardens in 10 paintings and by colour theme, terrace gardens on 2ha and thousands of varieties: old rose garden, peonies garden, maze, ornamental orchard, vegetable gardens, sculptures, English gardens, mixed-borders, wild gardens, boxed wood gardens, poetry gardens, patios. Cadiot Gardens has the only rose gardens of old roses in the Sarlat region (recommended visit time 15th May to end of June). 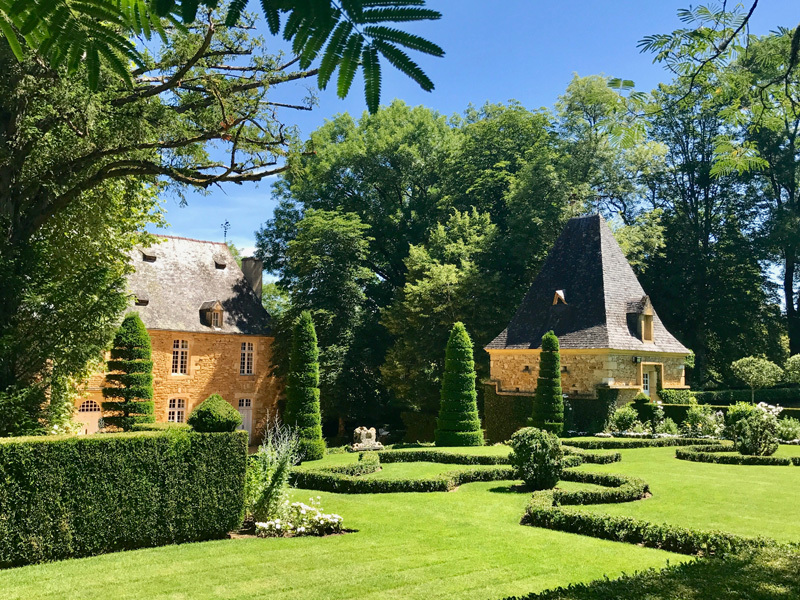 Also, from the vegetable garden to the orchard, from the peonies garden to the maze, a broad choice of original creations is brandished as a favourite for Périgord gardens by “Mon Jardin & Maison” (Garden magazine). Open from 1st May to 31st October. Buit in 1115 in a narrow valley close to the Forest of Bessède, Abbey of Cadouin, affiliated shortly after its creation to the order of Cîteaux, knows during the Middle Age a great prosperity. 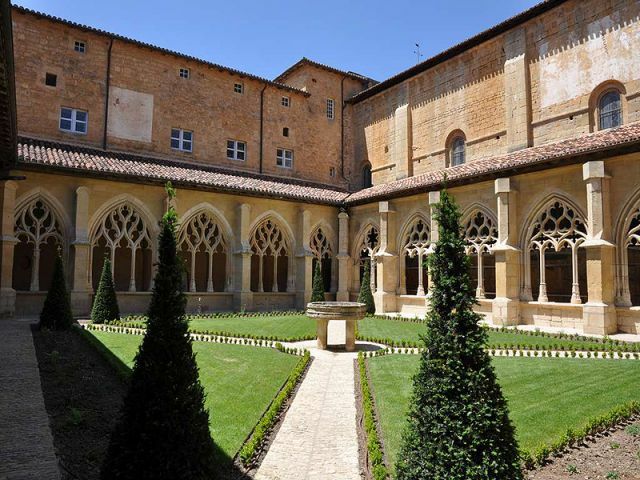 The church and the cloister, restored after the French Revolution, form a remarkable architectural complex. *Open between 12pm and 2pm during the scholar holidays and open every day. Auriane’s tip: the combined ticket with Biron Castle allows you a small discount for the two sites. Read Auriane’s article. The evolution of the silex size since 2,5 millions of years, the big milestones of the human culture, the Palaeolithic Periods. Exclusive and original collection of the first human art work. New acquisitions and everything on the quartenary fauna discovered in the Palaeontologic sites. Anthropology and burial rites, fauna hunted by the Prehistoric man. From 09.30am to 12.30pm and from 2pm to 5.30pm the rest of the year. Closed on Tuesday during low season. Discovered in 1940 and adapted for visiting in 1948, the quality and the number of its painting places this cave at the first location of the prehistoric sites in Europe. 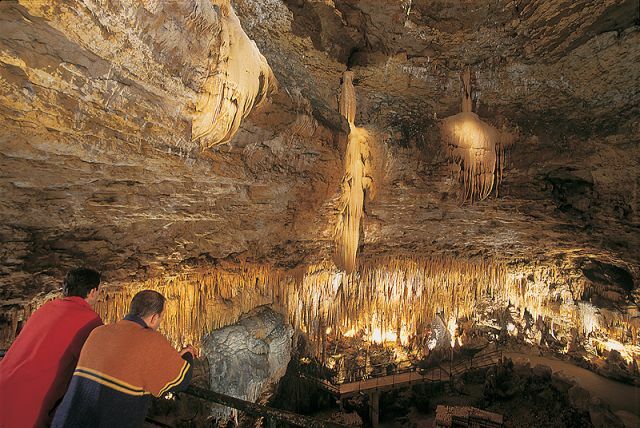 The cave attracted a lot of visitors, and within 15 years, more than one million came to admire the paintings. In 1963, it was decided to close the cave to preserve it as the carbon dioxide and the humidity led to the development of two diseases damaging the paintings. It is only twenty years later that a fac-simile project succeeded. 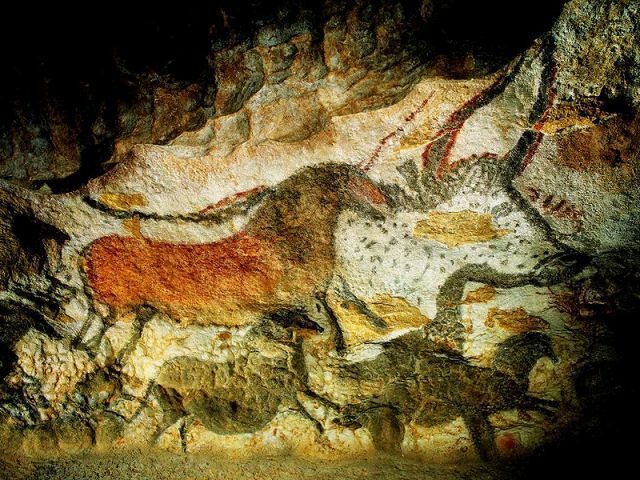 Lascaux II is a technological achievement where the science demonstrated a rigorous precision. All the reliefs are reproduced to the smallest details; the polychromes paintings are been drawn as per 17,000 years old with natural colorants. 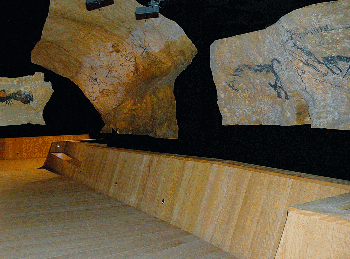 Situated 200m from the original cave, the fac-simile is an astonishing reconstitution of the superior part of the cave including the Hall of Bulls and the Axial Gallery. *open between 1pm and 2pm during the scholar holidays. Useful information: Tickets for Lascaux II are for sale in Montignac, close to the Tourist Office situated 2 kilometres from the cave. Auriane’s tip: The combined ticket with the Thot gives a reduced price for the two sites. Read Auriane’s article. 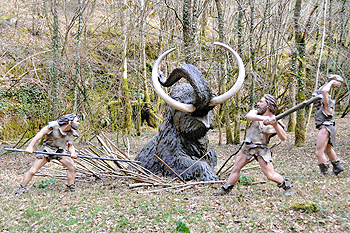 Overlooking the Vézère Valley, on the North hill of Thot, you will find the Prehistoric Initiation Centre. It includes, a museum showing a large panorama of the prehistoric art with the help of a modern museography and a park presenting the fauna, which the Cro-Magnon man used to live and to draw, as well as reconstitutions of prehistoric camps and daily life scenes. From 17/03 to 31/03: 10am- 12.30 and 2pm – 5.30pm / closed on Mondays. From 03/11 to 31/12*: 10am – 12.30pm and 2pm- 5.30pm / closed on Mondays. *open between 12pm and 2pm during the scholar holidays. Facing the Commarque Castle and situated 7 km from Les Eyzies, this prehistoric site dating from middle Magdalenian (around 15 000 years BC), dominates the Valley of the Grande Beune. In 1909, Docteur Lalanne discovered many vestiges (sharpened flint and stone bones) as well as a colossal 14metres long sculpted frieze on the wall. Parietal (sometimes 20cm deep) bas-relief and haut-relief horses, bisons, deers sculptures. Further work in the limestone rock shelter led to the discovery of a skeleton. Today, Le Cap Blanc is the most important sculpted prehistoric rock shelter open to the public. 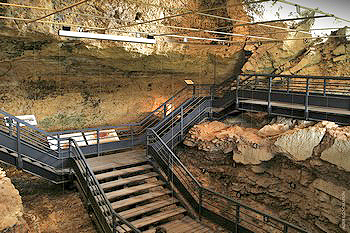 Auriane’s tip: tickets office situated at the cave of Font –de-Gaume (Sarlat direction, Eyzie exit). Read Auriane’s article. Remarkable for the magnificence of its site, classified "Monument Historique" (National French Heritage), Roque Saint-Christophe is a setting of rare and wild beauty. This 900 metres long and five floors limestone cliff dominates the Vézère Valley. Its hundred of sousroche shelters were the cradle of many civilisations from the prehistoric times to the Middle Ages. These prodigious caves could shelter up to a 1,000 men. You will discover the habitat of our ancestors as well as their tools, industry, art and cult. In this huge natural fortress, a remarkable troglodyte fort and its city were used as ramparts against the Normans and made of this place one of the most amazing place of the Vézère Valley. Open all year round, everyday for non-guided visits. Situated in Tursac on the Vézère riberbanks. This archeoligical site gave its name to a whole period of prehistoric history - the Magdalenian period. A period of semi-nomadic hunter-gatherer tribes around 17,000 years ago. Troglodyte upper level: mid-heights of the cliff, village adapted by the humans since the Middle Ages. Impressive 15th century Gothic chapel. Castle ruins on the plateau. Come and discover this amazing prehistoric park, with its recreations of our ancestor’s everyday lives, here, where they once lived. It is in the Goulet Valley that the well-known Vénus de Sireuil statuette was discovered. The visit will take you along the rock shelters; caves and habitats where a great number of tools and weapons made by prehistoric man (dating back to 12,000 years) were discovered. Auriane’s tip: “Pass Découvert”, in arrangement with other neighbouring sites, will provide some reductions from the third visit and a free 8th visit. Read Auriane’s article. On the right bank of the Vézère River and just before the village of Eyzies-de-Tayac, the high limestone cliffs have many rock shelters which are now partially collapsed since the prehistoric time: Laugerie-Basse is one of them. 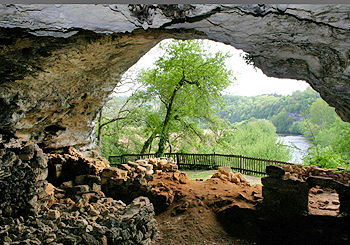 Through the discovery of the rock shelter, you will imagine the Cro-Magnon man daily life who lived there for around 14,000 years. Thousands of stone and bone tools were discovered and have been dispatched for private collections in many reknown museum. The beauty of these pieces discovered in Laugerie-Basse can be admired with a high quality diaporama. The archeological stratigraphy will take the visitor on a journey through time. From 17/03 to 31/03: 10am- 12.30pm and 2pm – 5pm / closed on Mondays. From 03/11 to 31/12*: 10am – 12.30pm and 2pm – 5pm / closed on Mondays. *Open between 12pm and 2pm during scholar holidays and open every day. Auriane’s tip: For an interactive visit, ask to use the tablet: virtual excavation site. Read Auriane’s article. This site, classified “Monument Historique” (French National Heritage), remained private and familial. You will learn how Roger Constant, creator of this site, fought with tenacity to keep his independence. Why this young Neanderthal man wanted to have his last sleep in Regourdou at the top of the famous hill of Lascaux? Was this prestigious site already sacred 50,000 years before the paintings of the prehistory time? 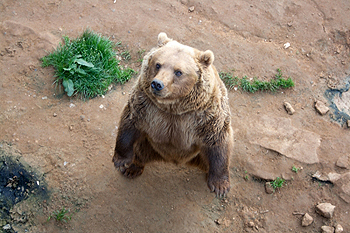 You can ask yourself these questions while standing in front of the oldest known stone boxing burial, which was surrounded by an extraordinary ritual: the brown bears were buried in pits intentionally connected to the human burial site. We need to pay tribute to Mr Roger constant, who since 1957, made the discovery of the man of Regourdou recognised by the scientists and which is today the oldest Perigourdin. High season (July and August): open everyday from 10am to 7pm. Low season (From February to end of June): open everyday from 11am to 6pm. 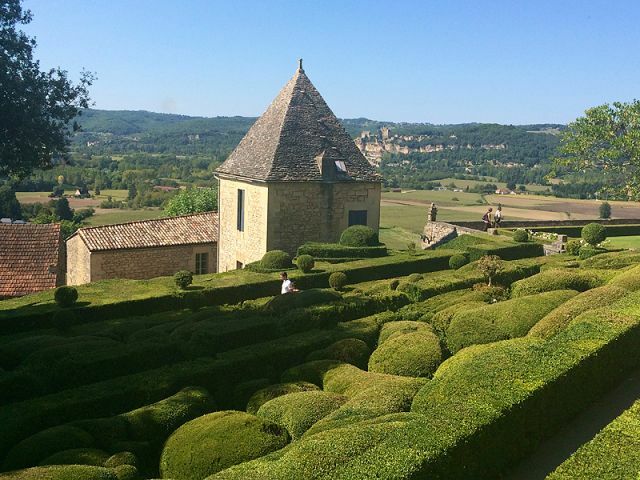 Auriane, our Blogger visited this place for you: you can find Auriane’s top tips that may be of help for your own discoveries. Read Auriane’s article. 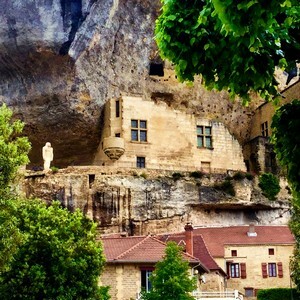 Until the 17th century, the history of Roque-Gageac is “a little town very close, depending on the temporality of the abbey, then the Bishop of Sarlat” (G. Tarde). At this time, the fortress was composed of a rampart, the castle of the bishops, with fortified noble residences and Troglodytes Forts. The remains that we are visiting today were part of an elaborated defensive system, which were the ultimate and unconquerable fortifications of this site. Built around the 12th century, the fort, which was entirely built on the rock, was impossible to approach or climb, which were the principal dangers at that time. It had many ingenious defences systems (defensive wells, parapet walk, arrow loops, loopholes, etc.). With time, it was improved and fortified and became a symbol of invulnerability. The fortress resisted to all the attacks during the One Hundred Years War and was never taken. The ramparts, fortified in 1662 and dismantled at the beginning of the 18th century were then used as a quarry. The preservation of this cultural history begins in March 1992. Open from 01/04 to 11/11. From 10.30am to 6pm in all seasons. Closed on Saturday in low season. At the heart of the Périgord, on the cliff overlooking the Vézère River, the Grand Roc cave presents itself like an exceptionnel architectural gem. Re-known internationally, this natural art chef-d'oeuvre offers famous cristallisations by their diversity, excentricity of their creations, their density and transparency as well as the variety of shapes defying the gravity law and its exceptional triangle shapes unique in the world. From 17/03 to 31/03: 10am - 12.30pm and 2pm - 5pm / closed on Mondays. From 01/04 to 11/04: 10am - 1pm and 2pm - 6pm. From 03/11 to 31/12*: 10am - 12h30 and 14pm - 5pm / closed on Mondays. Auriane’s tip: Night tours every Monday night at 9pm during summer. Read Auriane’s article. from 10.15am to 12pm and from 2pm to 6pm the rest of the year. Closed on Saturdays and Sundays from November to March. 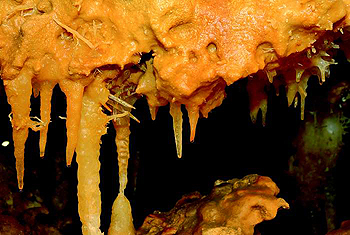 Discovered in 2000, caves with stalactites and stalacmites and especially “eccentric” cristallisations "cristallines or orangy". Extraordinary Sound and Light display showing off the cristallisations. Easy visit with a fairly flat ground. Open from Easter to All Saints Day. Group visits available all year round with prior booking except January. From 9am to 7pm in July and August. From 10am to 12pm and from 2pm to 6pm in low season. Closing at 5.30pm in October. Auriane’s tip: Photos allowed inside without lighning. Ideal to leave with beautiful souvenirs. Read Auriane’s article. 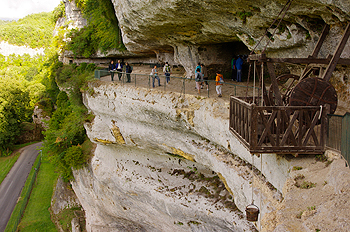 Protected by the beautiful hills of the Vézère Valley, The Gouffre de Proumeyssac is the largest developed cave in the Périgord (50 m). The density and the variety of the crystal formations adorned the walls of this huge underground vault and offer a real geological interest. 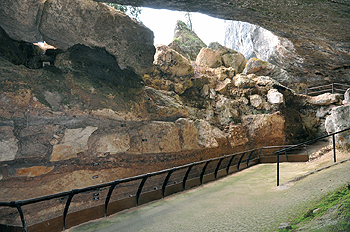 With a new light show created for the 3rd millennium and with important new facilities, the Gouffre de Proumeyssac reveals new charms. The new visit, using the state-of-the-art technology is answering the many expectations of the public. Outside, many installations were created for the total satisfaction of the visitor. A geological area to facilitate the understanding of the various geological phenomena. A forest trail to discover the flora present above the cave. A large welcoming hall with coffee shop, shop and library. A beautiful shady park with relaxing and picnic areas. All the installations around the cave are easy acess and free. From 9am to 7pm in high season. From 9.30am to 12pm and from 2pm to 5.30pm in low season. From 2pm to 5pm in winter. Auriane’s tip: Entrance of the park is open and free; the park also proposes educational geology activities for all ages. Read Auriane’s article. As surprising as its name, Bara-Bahau offers a double interest. The first part of this cave offers some beautiful seascape strata from the secondary era. Created by an old underground river, the cavity is spacious and unusual. About one hundred metres of this entrance: the chamber of engraving, intimate and calm, reveals with very little light the fantastic legacy of art. Adapting to the low light, we can now see on the walls many life-size animal scenes engraved with fingers or flintstone: A fabulous legacy of the Magdalenian Art. (17,000 years). Horses, bisons, aurochs, deers, bears, human hands and enigmatic signs are engraved in a very original style. 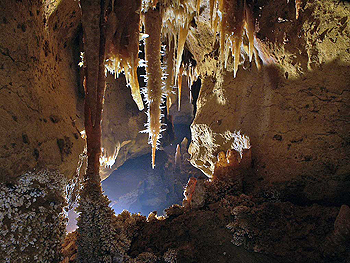 Bara-Bahau cave reveals many traces of bear presence, and especially, the very rare art scene created by the prehistoric artist, making of this cave a “bear cave sanctuary”. Open every day except: Between the end of the Christmas holidays and the beinning of the February holidays. Closed on Mondays from November to March included, outside scholar holidays. From 9.30m to 7pm in July and August. From 10am to 12pm and from 2pm to 5pm from September to December. From 10am to 12pm and from 2pm to 5.30pm from February to June. 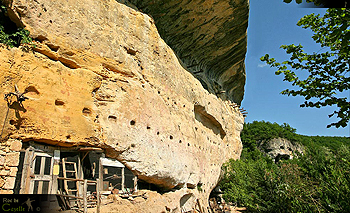 10 minutes from Lascaux, the Abris Troglodytiques du Conquil is a daylong visit in an exceptional site. Open visit of the shelter with a complete booklet. Prehistoric Leisure Park. Every day, flink knapping workshops, archery, prehistoric spear-thrower, Hunting trail possible with prior booking. Beverage stalls, picnic area, shop. Special tariffs are available for groups. From 10am to 7pm in high season. In the Vézère Valley, in Tursac, 6 km from Eyzies and 2 km from the Roque-Saint-Christophe, discover for the first time the daily life scenes of the first Neanderthal hunters. Irish Elk hunting during the Musterian period, deers cut up, mammoth and wooly rhinoceros hunting. The different events of our faraway history reveal the opening of spirituality with the creation of the first burial sites. Tursac Prehistoric Park aims to recreate various scenes of life at the settlement from a Magdalenian family (15,000 years), a fisherman and an engraver, prehistoric painters. 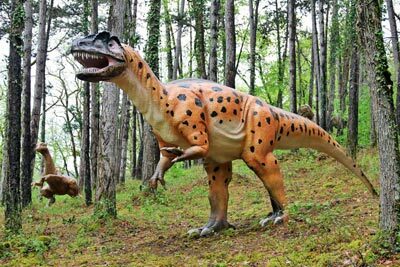 Characters and animals in Tursarc Prehisto Park are reconstituted from the most anthropologic research on skeletal remains. Relaxing time in a beautiful and protected site, easy access for all and open visit. Groups visit available with prior booking. From 10am to 7pm in July and August. From 10am to 5.30pm in low season. Auriane’s tip: “Pass Decouverte” will allow you reductions on neighbouring sites from your third visit. Read Auriane’s article. 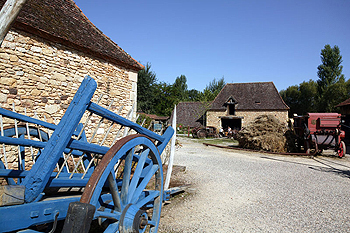 At the heart of the black Périgord, on a rocky steep that dominates the Dordogne, Beynac archeologic park invites you to discover the daily life of the first peasant and metal workers, from the Neolithic to the Roman Gaul (6,000 to 50 BC). 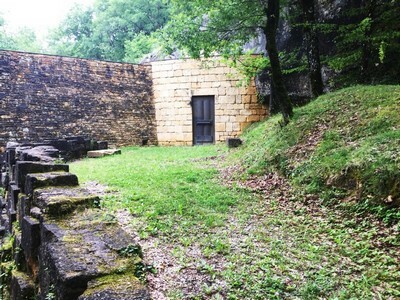 Beynac archeologic park is an open-air museum, with educational and experimental vocation, which organise workshop daysand international symposium. From 01/07 to 15/09 and from 10am to 7pm without interruption. Group visits available all year round with prior booking. The Bournat Village is unique: Firstly authentic, full of original ideas and character, whatever your interests; you will have a good time. On the banks of the Vézère River, you will live the Périgord’s life as per one hundred years ago. Visit duration: one to several hours. Auriane’s tip: Night tours each Wednesday during summer. Entertainment, bandas, Animations, bandas, soft lighning and fireworks. Read Auriane’s article. THE CABANES DU BREUIL, SAINT ANDRÉ D’ALLAS, BETWEEN SARLAT AND LES EYZIES, ON ROAD DEPARTMENTAL 47. 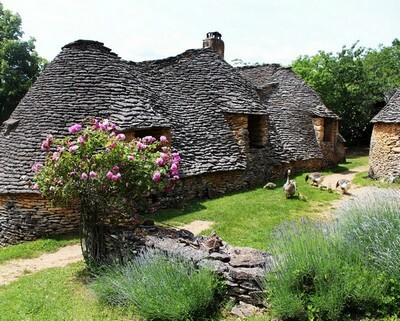 The Cabanes du Breuil, with their specific constructions, in dry stones were used in the past as traditional habitat, known as well under the name of “borie”, the Cabanes du Breuil make up a unique architectural in Périgord and in the large Sud-West. Their discovery allows answering partly the questions about their original shape. Open visit but with prior booking, the visit could be guided by the inhabitants of the family farm, which will explain their story. Classified “Monument Historique” (French National Heritage). Auriane’s tip: During summer the owners demonstrates the tradional way of bread-baking. Read Auriane’s article. The biggest freshwater and private aquarium in Europe. 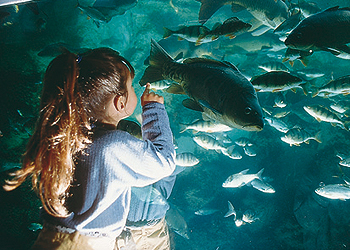 A recreational and educational site, the black Périgord Park AQUARIUM invites you to discover a fascinating universe of 3 000 000 litres of water, where you can observe, with natural light, more than 6,000 fishes in their environment. The black Périgord Park AQUARIUM is an open-air dream. With more than 30 tanks with trees, rocks and sun as decor, it is a fantastic way to understand and love the nature. From the shy little Gourami coming from Asia to the bala shark and the Spotted Silver Dollar, you will be endlessly surprised. From kiosk to kiosk, surrounded by vegetation like the tropics, an educational trail will make you discover the pilotis village and the exotic space before reaching IGUANA PARK. You will discover a 4.5m female python or the astonishing rhinoceros iguana. Auriane’s tip: buy 2 sites, free golf. Read Auriane’s article.